Residents of metropolitan Chicago will benefit from improved transit, roads, bicycle, and pedestrian facilities through $286 million in federal transportation CMAQ (1) funds targeted over the next four years to support the GO TO 2040 comprehensive regional plan’s goals for reducing congestion and improving air quality. Included is $35.25 million to convert 31 Indiana Harbor Belt Railroad (IHB) locomotives from diesel to compressed natural gas (CNG). The grant was facilitated by the Chicago Metropolitan Agency for Planning (CMAP). Once implemented the conversion is expected to eliminate 118.68 kgs of Volatile Organic Compounds (VOCs) on a daily basis, or 43.3 metric ton annually. Compared with diesel-powered operations, particulate matter emissions will decrease by 97 percent and nitrogen oxides emissions by 87 percent. The CMAQ Project Selction Committee minuted that the “IHB project has great cost efficiency and air quality improvements in areas with sensitive populations”, further noting the area had a high asthma incidence. IHB is planning to issue request for proposals early 2014. 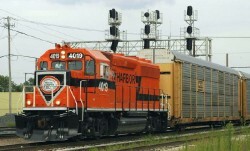 The Indiana Harbor Belt Railroad is the largest switch carrier in the U.S. with 54 miles of mainline track and 266 miles of additional yard and siding track. (1) The Congestion Mitigation and Air Quality Improvement (CMAQ) Program is a federally-funded program of surface transportation improvements designed to improve air quality and mitigate congestion. In 2011 CMAP began implementing GO TO 2040 through the CMAQ program by having Program Focus Groups prioritize project applications based on how they support the goals and action areas of GO TO 2040.